Sincerest thanks to Ken Knowles and BankGloucester! Wellspring House extends its sincerest thanks to Ken Knowles and BankGloucester for last month’s auction to benefit Wellspring. “The Mayor’s Race”, an 8’ x 12’ mural by Rockport artist, Ken Knowles, now hangs in the main lobby of BankGloucester’s 160 Main Street office. A smaller version of the painting was auctioned on September 10th, with proceeds donated to Wellspring House. 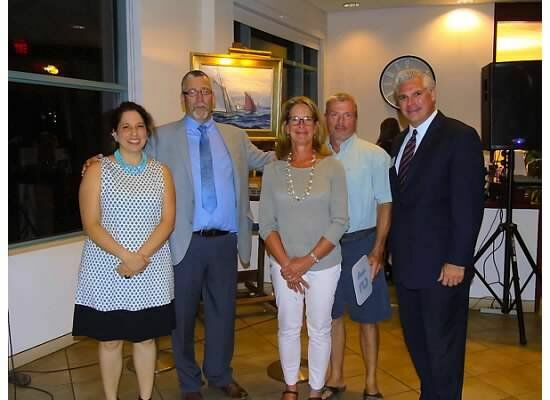 Pictured from left are Wellspring’s Executive Director, Melissa Dimond, artist Ken Knowles, auction winners Debbie and Nick Holland, and BankGloucester President, Pat Thorpe.